Snapchat has become one of the famous platforms because of its filters and various funny options. People are even using their websites to increase the followers. Do you want to get gain more followers from your website? Do you know how to add Snapchat Snapcode in WordPress? Many people are using it even for their business growth. Wouldn’t be great to have a conversation with your clients in such an amazing habitat? In this tutorial, you will learn different methods to add Snapchat Snapcode in WordPress. Use A Plugin To Add Snapcode on Your Website. First of all, you have to log in to your Snapchat account. You will see many options from which you have to choose “My Snapcode”. It will take you to another page. At the “My Snapcode” page, you will see the buttons to download the code. Just click on the download button and a ZIP file will get downloaded to your computer. Extract that file and you will find two images with the extension .svg and .png. You have to use the PNG image. Upload this image to your WordPress media library. Just navigate to Media>>Add New and upload the PNG image. Now install and activate the Snapchat Snapcode Widget plugin. After installation, go to Appearance>>Widgets and you will see a new Snapchat widget. Just add it wherever you want to show your Snapchat code. In most of the cases, the sidebar is recommended due to better visibility. You will see an option to “select image” from the media library. Choose the Snapchat image you just upload and save the settings. You will see the Snapchat logo in the sidebar. Basically, this will take your website visitors to your Snapchat profile which would be a positive impact. Add Snapchat Image Without Any plugin. If you have tried your hand in HTML then you can add that Snapchat image in the sidebar without any plugin. Do you know how to add an image in the WordPress sidebar? You just have to copy the URL of the image from the Media library and paste that in the <img> tag. It requires HTML coding skills. You would be happy to know that there is another plugin to add an image in the sidebar. Just install and activate Image Widget plugin and you can add the Snapchat image in the sidebar. Though you wouldn’t need this plugin if the above-mentioned plugin is available. Just save the settings and start counting your new followers. Can you Now Add Snapchat Snapcode in WordPress? Sometimes, it may be challenging to the beginners because of the generation of the code and everything. But with the use of WordPress plugins, you can do anything you want. If you’re a beginner then it’s recommended to use the Snapchat plugin. I hope now you can add Snapchat Snapcode in WordPress. Now-a-days, Snapchat can earn a solid spot in your marketing strategy if you give it a chance in your business model. 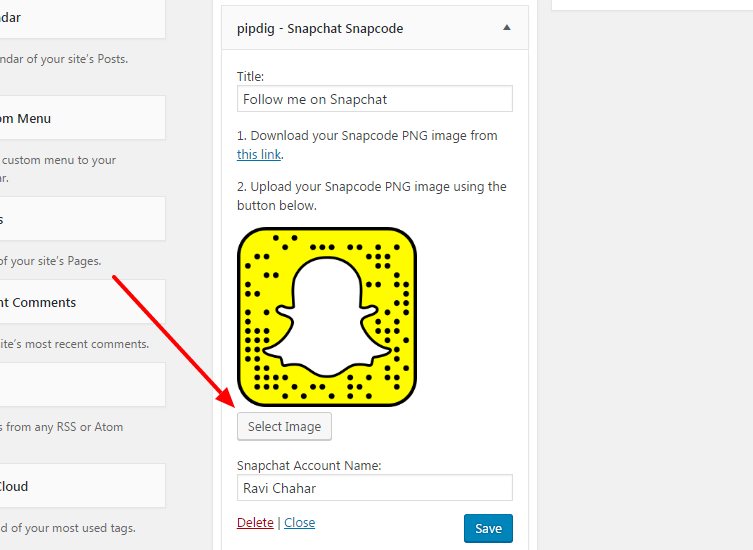 It is absolutely very simple idea to add Snapcode on website with plugin. Thanks for sharing. It’s a good idea to add Snapcode if you are implementing any kind of Snapchat marketing strategy. I would be far more apt to use the plugin because I just don’t get into any of the coding, myself. Either way, though, you have given pretty clear instruction to make this happen. Snapchat has become one of the favorite platforms of many. People are really into its marketing. Using your website can be a great idea. The plugin developed for Snapcode is easy to use.